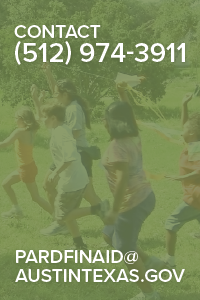 The Austin Parks and Recreation Department is now accepting Financial Aid applications for youth programs. What Assistance does the Program Provide? 50 percent off registration costs for Austin Parks and Recreation Department (PARD) youth programs and services. Youth that get free lunches or go to a Community Eligibility Provision (C.E.P.) school qualify for up to $300 in scholarships for PARD youth programs registration costs. Youth who live within Austin city limits who get or are income eligible to get free/reduced school lunches. Individuals 18 to 22 years of age who receive special education services in school also qualify. How do you apply for Financial Assistance? Include a copy of the school free/reduced lunch letter with your application or complete the Attestation Section of the application. Completed applications can be emailed to PARDFinAid@austintexas.gov, faxed to 512-469-2957, or delivered to Austin Parks and Recreation facilities that offer youth programs. Financial Assistance and Scholarships last until December 31, 2019. Renewals required annually for continued participation. To register for Austin Parks and Recreation youth programs, visit www.austintexas.gov/parksregister. Be sure to apply for Financial Assistance several weeks prior to program registration. Due to the volume of submissions, your Financial Assistance application may take up to three weeks to process, and the discount will not be applied to payments until your application is approved.